Looky here, looky here! It's the return of Knoxville Lost and Found! My apologies for the long delay, readers, but your humble history blogger has been very busy in the new dad department. When we had our first child over two years ago, the blog slowed down. When we had our second, it ground to a halt. But Knoxville, you need to know your history so I have returned to take us to the surface parking and empty lots of the city. 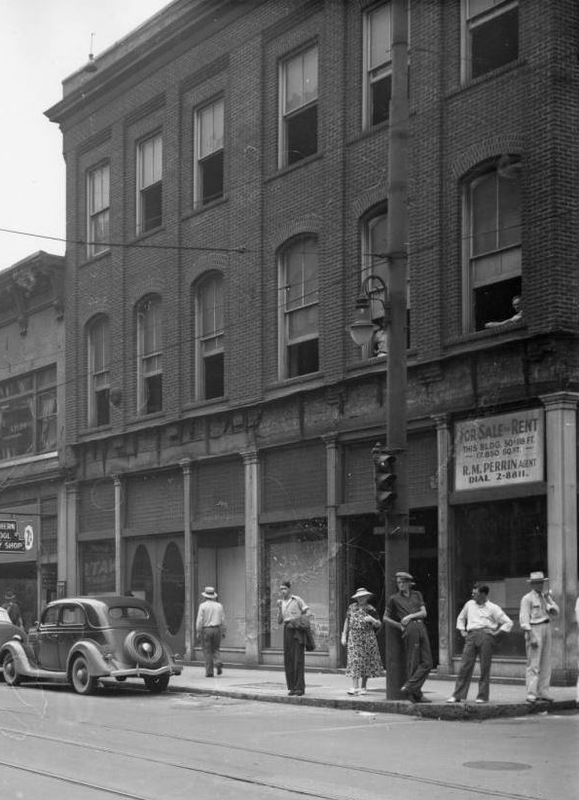 We're going back in the time machine to look at the lost buildings of Knoxville past starting with the fifth installment of the "Gaps of Gay Street." To recap, we started in the giant hole next to Mast General Store, here. We followed up, just to the north of the Century Building here. Next, we crossed Summit Hill to the Cradle of Country Music Park and discussed the long gone 200 block here. And last time, last year, we crossed Gay Street to start moving south and looked at the west side of the 200 block here. This time we have walked a little further south on Gay Street. 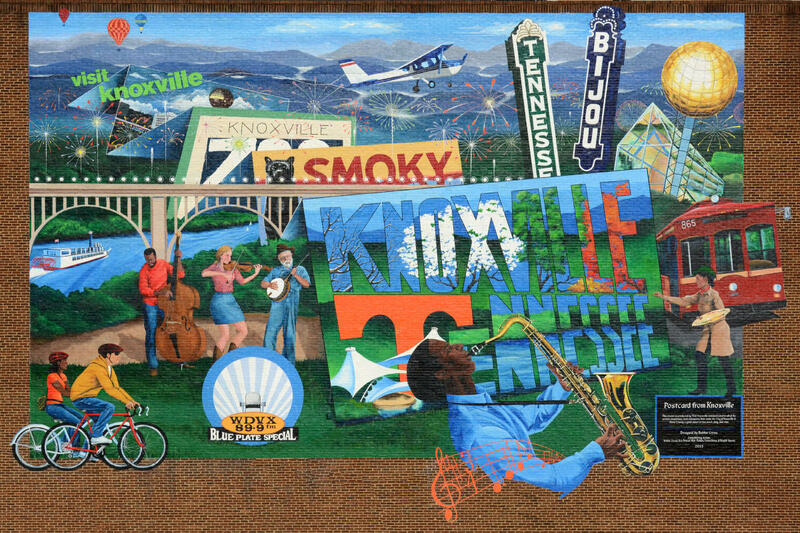 We've just passed the Knoxville Visitors Center, and we've found ourselves staring at the lovely "Postcard From Knoxville" mural. The mural depicts the things that make Knoxville a great place to be, theaters, musical heritage, trolleys, airplanes, and gold balls. 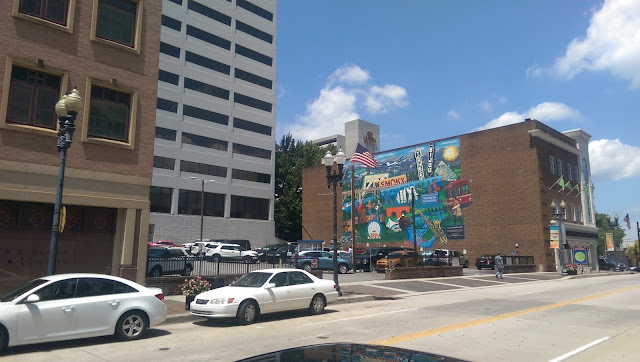 It's fun to look at but one must realize that the reason it can be seen is because it looks over a nice, large, surface parking lot (a Knoxville mainstay that somehow didn't make it on to the mural). The parking lot is currently owned by the United States of America, meaning it is attached to TVA. This means that it is probably not going to be anything other than a parking lot for a very, very, very long time. Bearing that in mind, we're lucky to have the mural to pretty-up an otherwise mundane spot. So what was there before white SUV's with US Gov't tags on them? Let's take a look. Before focusing on the parking lot, let's take a look at the two structures that flank it and which form the bookends of the block. First up, is the Knoxville Visitor's Center at 301 South Gay Street, home of the WDVX Blue Plate Special. Parking lot located at 305-311 S. Gay Street. Knoxville Visitor's Center at right. In 1884, the building that you see today did not yet exist. At that time, it was a collection of two, two-story commercial facades. 301, the corner of Gay and then Commerce Street (which was destroyed by the installation of Summit Hill Drive) housed a druggist and 303 housed a tin shop. The druggist, William D. Kuhlman, started his chain of drugstores here in 1894. Later, in the 1890's, Kuhlman's, would occupy both store fronts and would create a more homogeneous building. Kuhlman's Drug Store, corner of Gay and Commerce (Summit Hill). As business expanded, so would the store, becoming the three story building that we know today before 1903. Kuhlman's was know for carrying the Rexall brand of drugs. Kuhlman's occupied the spot until 1925, when Chambliss Drug Co. moved in and took over. Chambliss didn't stay in the location more than a decade. Then Liggett's Drug Store moved in and 1935 finds the Watson IRA-A Co. Dry Goods store located in the spot. This was followed by a small, national chain department store, Raylass, which opened in the spot in 1937 and stayed until the 1950's. An ad for Raylass taken during the constuction of the W.T. Grant store in 1956. Raylass employed 175 people at the time of it's opening, so it was a full-service department store. Raylass had men's and boy's clothing, furnishings, and infant wear on the first floor. Women's, misses, children's millinery, underwear, sweaters and linens were on the second. Offices and restrooms were on the third floor. Shoes along with "toyland" were in the basement. Raylass closed after Christmas 1958 and the building would be taken over by General Products Corp., the kind of place you'd find a Zenith TV. That venture held until the 1980's when the bottom floor became a Wendy's (which won a beautification award for remodeling the exterior of the building). Since the 2000's it has been home to the Knoxville Visitor's Center and visitknoxville.com. On the opposite end of the block, there were a couple of much grander operations over the years. The south end of the block housed the "Haynes Block", a very pretty, brick building of the Victorian Commercial vernacular. The Haynes Block, 323-317 S. Gay Street. The corner of Gay and Wall. In 1900 the corner housed M.B. Arnstein dry goods. 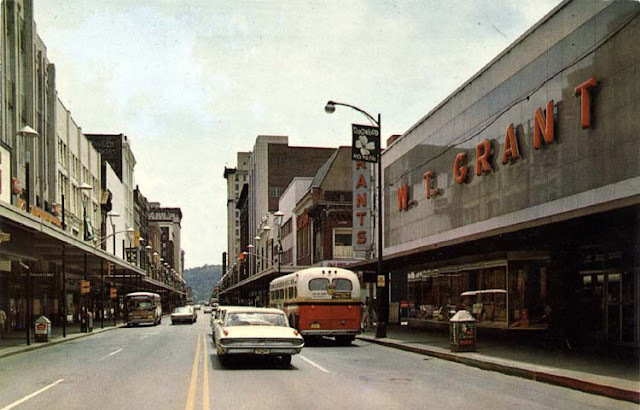 Founded by Max B. Arnstein, the dry goods company would become one of Knoxville's premier department stores. The name is carried on downtown, on the building he built to house his grand store, The Arnstein. In 321 was located the Sullivan, Underwood, Woods Clothing Co. 319 housed Hall and Haskins Furniture and at 317 Smith and Sterchi Furniture. M.B. Arnstein prior to 1905. The largest change to the block came around 1911 when S.H. George Department Stores opened up in 323 and 321. By 1935, S.H. George would encompass the Hayne's Block as well, forming one massive department store. The S.H. George and Sons Department Store. Corner of Gay and Wall. S.H. George and Sons was a nice, major, full-service department store. In many ways, a forerunner of the modern department stores. 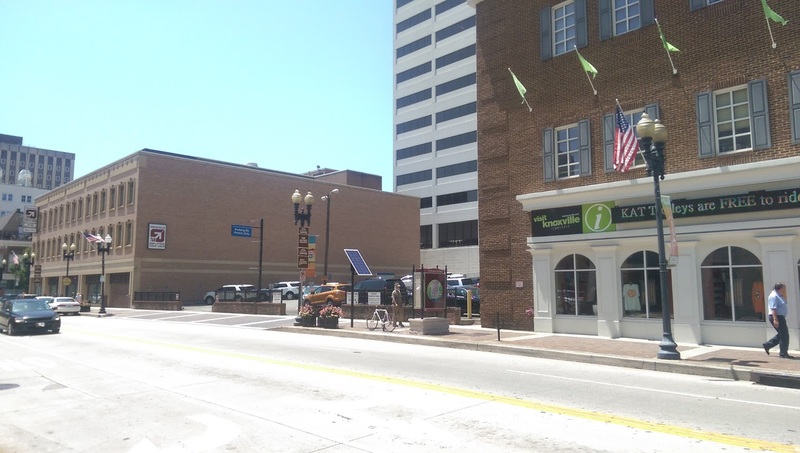 It, along with Miller's further south, anchored the downtown business district. Folks traveling the circuit from Millers, to the Markethouse, to George's would stop into the little shops in betwee, giving life to commerce downtown. That would begin to decline when Rich's department stores of Atlanta purchased S.H. George. Rich's set up shop across downtown on Henley, closed S.H. George and altered the anchor system in downtown Knoxville. As many know, ultimately Miller's bought Rich's and eventually closed Miller's Gay Street location. This left Gay Street without its two most important anchor stores. All was not doom and gloom though. In 1956, a new large scale retailer came to town and leased the S.H. George location. This store was known as W.T. Grant. You can read up on W.T. Grant stores here, suffice it to say they were variety stores sort of like proto-Kmarts. The S.H. George building occupied land owned by the McGhee and Sullivan estates. In fact, the building next to S.H. George was knows as the Sullivan building. The plan was for W.T. Grant to tear down the S.H. George building and replace it with a store built in their corporate model. This meant large, windowless granite walls. Design proposal for W.T. Grant at Gay St. and Wall Ave. The plan was executed and the S.H. George building came down and was replaced by the Grant building in 1957. W.T. Grant in its heyday. W.T. Grant operated in the spot until 1975 when the nationwide chain became insolvent due to poor credit lending practices. Sometime shortly after the construction of the TVA towers, TVA leased the W.T. Grant building and moved it's nuclear plant design team into the building. By this time, the McGhee estate and the Lenoir City Co. (associated with the McGhee estate) owned the whole of the property. In 1988, the TVA Credit Union proposed consolidating its three downtown locations into one at the Grant building. At that time, TVA Credit Union proposed a radical redesign of the building, adding windows ,an atrium, and a third floor. And that's the building that we know today. Rendering of the proposed home of TVA Credit Union. Returning to the demolition of the S.H. George building, the neighboring Sullivan building at 313 Gay St. was not to be torn down even though it was being used as part of the S.H. George store. It was the only other building on the south half of the block between Curry Ave. and Wall Ave. Unfortunately for the Sullivan Building, the George demolition weakened its walls and the building crashed to the ground. It was reported that ten minutes of groaning and a loud cracking noise gave the workers just enough time to run from the crumbling building. News photo of the collapsed Sullivan building. Looking Northwest, the Askine-Marine building was across Curry Alley. When S.H. George occupied the building, originally two stories tall, a third crudely built brick story was added to round-out the George complex. The Sullivan building had been connected to the Askine Marine building across Curry alley by a covered, second story walkway. That was left hanging when the Sullivan collapsed. S.H. George had leased the upper two floors of Askine Marine to use as office space. When the Sullivan Building fell in 1956, it became the first vacant spot on the block. Never to be occupied again by anything other than surface parking, the News Sentinel quoted Judge John M. Kelly as stating, "probably better or more profitable use of the property than a building or store." The push for parking downtown was on. Prior to being a vacant lot or part of S.H. George, the Sullivan building had been W.T. Newton Jewelers and B.H. Sprankle Clothiers before that. Another part of the S.H. George complex, 315 S. Gay St. had once been the Majestic Theater in the 1910's. S.H. George would go on to occupy 315 after 1926. A third floor would be added at that time. Crossing Curry Alley and moving north to 311 and 309, we would find the third most interesting building on the block, the Sanford Block (I have been referring to it as Askine-Marine, the last business to occupy the building). Built in the 1890's, The Sanford Block replaced a wholesale grocery Store. The Sanford Block, 2/3rds of it anyway. The Sanford block, named for the prominent Knoxville family that owned it, was occupied by several businesses over the years. In 1900, it was Union Parts. 1910 brought the Spencer Trunk Co. By 1920 Spencer downsized into 309, 311 was occupied by Day Co. Clothiers. 1925 bought Underwood and Lea to 309 and Trivers Clothiers to 311. 1935 found our good old friend Bill's Auto Parts in 309 and Johnson's Clothing in 311. Askine Marine Clothing occupied 311 in the 1940's and 50's with Dailey Clothing next door. Those were the last two business to occupy the Sanford block. Next door to Sanford, was a less interesting, 2-bay, Victorian commercial building. 307 and 305 were many things over the years. 307 in 1900 was David Friedman Clothiers, then Caldwell Nance in 1910. It was WJ Heins Jewelers in 1920, then Davis Clothing in 1925. By 1945 it was split between Dixie Cotton Shop and one of Knoxville's first Krystal locations. The last thing located there was Demarcus Otto Jewelers and Krystal. 305 was Whittle Trunk Co in 1900, Mitchell's Cafe in 1910. It became the Ocean Restaurant by 1920 and Dickson's Restaurant by 1925. In 1935 it was Nisley's shoe store. By the 40's and 50's 305 was known as Dean's Clothing Store. Inside the Ocean Cafe at 305 S. Gay Street. An ad for Nisley Shoes. With the Sullivan building down, what became of these other smaller buildings on the 300 block? In 1958, the J.B. & W.G. Brownlow Real Estate Firm owed the property and was contracting with Safety Park Company. The Fitzgerald estate owned the old Kuhlman Drug building at 303-301. Brownlow hoped to acquire that spot as well to create a large, surface parking lot to serve W.T. Grant customers primarily. Mayor Jack Dance was keen to support this project, as it was widely perceived that parking was an issue on the north end of downtown. Strangely, the city had deactivated its parking commission at the time, so there was little regulation of city parking. With regard to its own properties, Brownlow got it's wish and 311, 309, 307, and 305 were raised. The lots were joined to 313, where the Sullivan building had fallen two years earlier, and we got our present day parking lot. 311-305 S. Gay Street, 2017. 305-311 S. Gay Street, 2017. 301-323 South Gay Street, late 1930's. Kulman's building (Knoxville Visitors Center), Sanford Block center, S.H. George (TVA Credit Union) at left. The same view but closer. Note the very odd bricking on top of 315, the Sullivan Building. Askine-Marine and Dailer's already occupy the Sanford Block. Dean's was located at 307 in this photo. 307A, the spot to the right of Deans, would become Krystal. Thus, the end of a very active commercial block in downtown Knoxville. Driven by impressive department stores. Diminished by the fall of a retail giant. Ultimately demolished intentionally for the goal of accommodating 86 cars. The middle of the 300 block has been a parking lot for 59 years as of this date. Under the ownership of the Federal Government, it will likelybe parking for at least another 59 more. County officials announced that they were selling the Andrew Johnson Hotel back into private hands, so maybe there is hope for this lot yet. Until next time in the "Gaps of Gay Street" when we visit the Krutch Park extension, otherwise known as the hole in the 500 block. Stay tuned. Photographs used with permission from the McClung Collection of the Knox County Library System. I love your blog! Thanks for the history lessons. Pleas continue.